Today is my LEAST favorite holiday and has been since my first year of teaching! 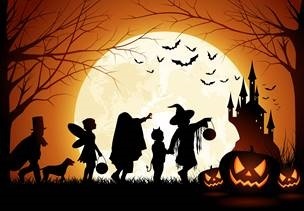 I always liked Halloween before I started teaching — who wouldn't like an opportunity to get free candy or at the very least have lots of candy around to munch on. I can honestly say I never gave a thought on what all that monster hype and sugar did to kids. And, did I mention my first year I taught high school seniors? I can't even imagine what it is like in an elementary school. Years later I did teach in middle school so I do know what it does to those developing minds! And, is it universal or just middle Georgia, but the month of October is also Drug Free Schools month and all the kids do these morbid pictures on what drugs and drinking and driving do to you. Talk about X-rated violence. Not that I don't agree with Drug Free Schools, it is just when you combine that with the sudden reappearance of every slasher movie ever made, all the candy, and all the hype you end up with — wait for it — HYPED up kids! It became a real nightmare to me when I started teaching students with emotional behavior disorders. October was a stress filled month and it comes right before the two big family holidays and all the stress involved there. So, back to my original statement. I really don't like Halloween! But I love the fall... The crisp, nippy air at least until about 10:00 in the morning when the sun starts shining and then it goes back up to high 80s! As I write this article, I am actually in Oklahoma City. As I prepare to go to another part of the country I always print out the 5 day temperature chart and then I also print out our local 5 day forecast. I do that because I know what it feels like at home, right? Well the funny thing was the highs were all exactly the same for Warner Robins, GA and Oklahoma City but the lows were way off. Our lows were about 10 degrees cooler. What I have realized is we get just as cold as a lot of places but we get much warmer later in the day so the temperature variance could be as much as 30 degrees! That kind of variance can make you have personality changes! Or at least that's my story and I am sticking with it! Speaking of Oklahoma... I am speaking with a group of great special education leaders who belong to a group called the Oklahoma Directors of Special Services (ODSS). We have been working with them for several years now on becoming a CASE subdivision. They have had their president attend our Board of Directors meetings, had members participate in the July Legislative Summit and other CASE professional development opportunities. We believe they will be a CASE subdivision real soon. Are you in a state that doesn't have a CASE unit? Emilie Maule, our CASE Unit Representative would love to talk to you and help you develop a unit. Why? Because by being a part of CASE you become a part of a louder, broader voice and you will have additional resources at your fingertips. You will have a national and even international perspective and can partner with people from so many other places. It really is true, Together Everyone Achieves More! You might even be surprised that there is already a group working on a unit in your state. We are actively working with about 4 states right now! Did you know we have CASE members in all 50 states and 5 Canadian provinces and 6 other countries? We currently have 38 state units and 2 Canadian provinces with units. Let us, hear from you if you are interested! Sometimes technology is REALLY slower than we like... Our online shopping cart is still down for revision, so if you are wanting to order any of our practical resources, just download our order form and either fax or scan it back to us! If you have any problems or just need to ask a question, then contact me ASAP! We are so excited about our 2017 CASE Hybrid. As we have talked to our members and Board of Directors, the issue of Mental Health in our schools seems to be one of THE hot topics! What an amazing opportunity to have some of the nation's leading practitioners do a full day on mental health in our schools and community. This will be a day you will want to pull in your general education teachers, administrators, school psychologists, special education staff, community and parents together so you can take the information and personalize it to your area/schools! And the Hybrid is just the format — one price and you can have as many as you would like in the room. What a great time to have everyone hear the same thing and then apply to your students and families! The second day will be the legal implications of some of the mental health issues as well as a general legal update. So, you need to start getting the logistics lined up for Feb. 23-24. All you need is a big enough room, internet, LCD projector, sound and screen! We don't even mind if you want to charge a registration fee to either cover the cost of snacks/lunch or make money for a school project! OR... you could come to be with us at the point of origin, Clearwater Beach, Florida. Just think about what it will be like the week of Feb. 20 where you live and what it will be like on the warm, white sands of Clearwater Beach, Florida! If you ever attended the CASE Winter Policy Institutes, you might remember the lovely Sheraton Sand Key Resort! Though, the hybrid isn't run the same way, this is still a great location for any meeting in February no matter where you live! The room link is already live so go ahead, start planning that winter get away! This conference format is perfect for maximizing your professional learning dollars since the registration for sites is the same as just one registration! Save the dates now — Feb. 23-24! Last week's poll asked you what keeps you up at night. There are a lot of things that are keeping us up at night! The largest group at 41 percent was parent issues. And actually a couple of the "other" answers involved parent issues, though more specific. There was a three-way tie for the next largest group at 13 percent: funding, litigation/due process, and "other." 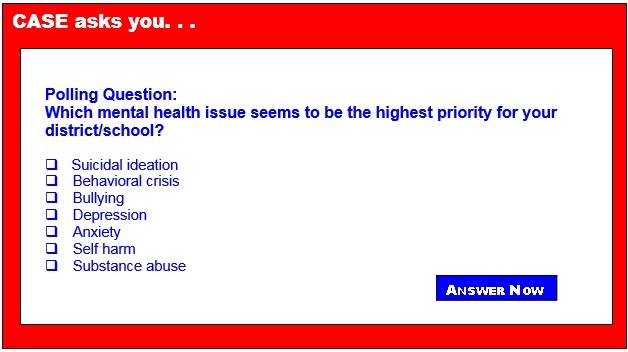 Some of the "other" issues were parents' demands that bled over into the due process, regulations and staffing needs. Several folks noted in "other" All of the Above! There were also a couple of answers that were very specific to the needs of low incidence areas like deaf/hard of hearing/cochlear implants and low vision. Medicaid billing also made the "other" category. There was another three-way tie at 7 percent: personnel issues, professional learning and special education regulations. I should have also listed general education regulations — sometimes we forget about those. Maybe they are more on my mind because of the proposed regulations coming out in bits and pieces on ESSA! There is so much to keep up with — maybe that is what the All of the Above answer was about! Hope you survive the onslaught of trick or treaters tonight or maybe your community did it last night but I find when our community declares one night that isn't the 31st, we still get some folks on the 31st! I hope you also survive the fall and get a little bit of sleep. Maybe you should purchase Lucky 21 #1 for all your teachers — it is still one of my favorites: Avoiding Legal Disputes In Special Education: 21 Training Points For Administrators! Even though the title says for Administrators, it would be a good preventative for the teachers to read it! It is on our order form. Olweus (1993) defines bullying as a subset of aggression that is characterized by 1) purposeful actions (i.e., intention to harm); 2) repetition (i.e., the behaviors occur frequently); and 3) a power imbalance (i.e., the victim is unable to defend him/herself). The negative psychological and physical repercussions of bullying are extensive. As a result, school prevention and intervention procedures are increasingly utilized to decrease occurrences of bullying situations between students. For the best results, bullying programs should incorporate three tiers of increasingly intensive intervention (Espelage & Swearer, 2008). When choosing an intervention, educators should consider the unique components and targeted skills of each program instead of adopting a "one size fits all" approach. OSEP celebrates Down Syndrome Awareness in October! We're Kicking off CEC 2017! Trouble keeping up in school?